Pigs can be a fun and profitable addition to your farm, whether you are raising a pig for meat or to breed more pigs to sell. It can be a challenge to care for piglets, however, and you need to be ready to meet their particular needs in order to raise thriving, healthy pigs. Before you set up room for your new piglets, check with local officials about any restrictions on raising pigs. While many communities are becoming more open to urban and hobby farming that may include chickens and other poultry as well as the occasional goat or other livestock, pigs are often one of the least welcome additions to neighborhood farms. Also be aware that pigs can live 15-20 years, and be sure you are committed to providing the animals with good, healthy lives if you plan to keep them. These are social animals that require interaction and companionship to stay mentally healthy, and you need to be prepared to give pigs that company, either with additional animals or your own presence. Piglets need a warm place to stay, particularly in the first few weeks of their lives. Their accommodations – whether a box, sty, stall or similar shelter – should be free of drafts, and a supplemental heat lamp will be necessary if you are caring for just one piglet or only a few animals. Because pigs are often born in large litters, they are adapted to snuggling together to share body heat, and you need to be ready to simulate those conditions. 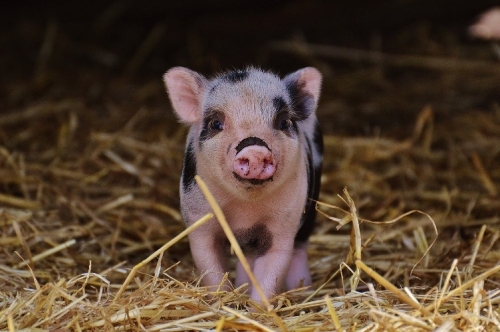 Use hay or straw as bedding for piglets, and provide a very deep layer of bedding to accommodate their native instinct for rooting and digging. A deeper bedding layer will also provide better insulation to help keep the animals warm. Be sure to include a more absorbent layer, such as wood shavings, at the bottom, and clean the bedding regularly. Newborn piglets will need a good dose of colostrums – mother's milk – to transfer vital antibodies and essential immunoglobulins to their systems right after they are born. While feeding on colostrum is not necessarily critical, access to it right after birth will have a very positive impact on their survival rates and long term good health and development. A young piglet needs a diet of warm milk fed in increments of every 30-60 minutes during the day and every 4-6 hours at night. As the piglets grow, they can be fed less frequently, and most piglets are fully weaned by the time they are 4-8 weeks old. When weaned, piglets should be fed a relatively diverse, balanced diet that includes corn meal or soybean meal, fruits, vegetables and food scraps. Allowing young pigs to forage naturally will also allow them to snack on insects and native plants, all of which are great options for their omnivorous dietary needs. If your piglets are going to be kept in the same pen or general area throughout their lives, they will need regular deworming. Parasites will build up in the soil, and a deworming regimen is essential to ensure the piglets are not heavily contaminated. Consult with your veterinarian to determine which worms or other parasites pose the greatest risk to your piglets and to develop and appropriate deworming plan. Young piglets need to be processed in several ways. This can include castrating hogs, docking tails to minimize biting or infections, clipping on identification tags or notching ears, clipping teeth to minimize bite injuries from sharp teeth and administering iron injections to counteract any deficiencies. These tasks can be done as early as when the piglets are just 1-2 days old, but if they are weak or underweight, it may be best to wait until the piglets are 10-14 days old before this type of processing. It can be difficult to raise newborn piglets, but with good attention to their needs, they will quickly grow stronger and sturdier, and you'll be glad you took great care of the youngsters as they become profitable pigs for your farm.